Your Employees | CornerVine Inc.
CornerVine helps your employees stay connected with your customers. By providing a social network that's tailored to your store, your employees and customers can stay connected, even when your customers aren't in your store. Employees can quickly see your customers' ratings, notes, and favourites, and your customers can quickly see what your employees are drinking and what they have to say about your products. Your customers can be featured in your CornerVine system so that customers can quickly see who works at the store and which products are in their rating histories. CornerVine helps your employees stay connected with each other. It's not just your customers who benefit from seeing what your employees are drinking, rating, and adding notes for. Your employees can benefit from keeping track of each others' tasting experiences. When it comes to wine, some of your employees will enjoy one type of wine more than others. Some may have more expertise when it comes to different countries or regions. By keeping all your employees connected in CornerVine, the ones who know more about certain types of products can help those who know less, even when they aren't in the same room. That information is always in their pocket, even if they're not working together at the same time. If your store sells wine, spirits, beer, or any combination of those products, you may have some wine experts, some Scotch experts, some craft beer experts, etc. By keeping your employeees connected, they can all leverage each others' expertise. If your company has multiple locations, you can leverage the expertice of your best employees by allowing your other employees access to their ratings and notes, even if they aren't working at the same location. CornerVine makes it easy for your employees to manage your online sales. For online purchasing, you can notify any number of employees by email or push notification when a new order comes in. Employees always know if someone is processing an order without having to communicate directly with them. When orders are processed and are ready for pickup or delivery, CornerVine automatically notifies the customer. CornerVine takes away the pain of keeping your inventory online and up-to-date. Because we integrate directly into your point of sale system, any time you add a new product, it's automatically added to your CornerVine system. You never have to worry about what you have in stock or what's no longer available. CornerVine automatically updates your online system as your in-store inventory changes. 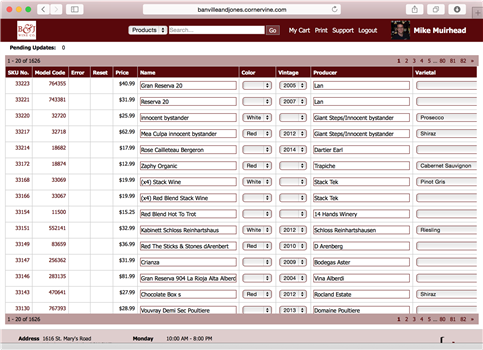 If you have product information that's missing in your point of sale system (such as additional varietal, region, or taste profile information), CornerVine allows you to add missing information on a product-by-product basis, or gives you a spreadsheet-style utility to update information for multiple products at the same time. If you're missing product photos for any of your products, CornerVine gives you several ways to add photos to your system, including a utility in your native mobile app that's as easy as scanning a barcode to find the product, taking the photo with your phone or tablet, then saving.